Weddings are a celebration...of love, friendships and family. When I arrived at this bride’s home for her preparations at the beginning of her special day it became immediately apparent to me that her grandmother held a very special place in the bride’s heart. The bond between the bride, her mother and her grandmother was felt by everyone present. I took the opportunity to compose and capture an assortment of portraits, both casual and contemporary...and traditional...of the three generations: the bride, her mother and her grandmother. 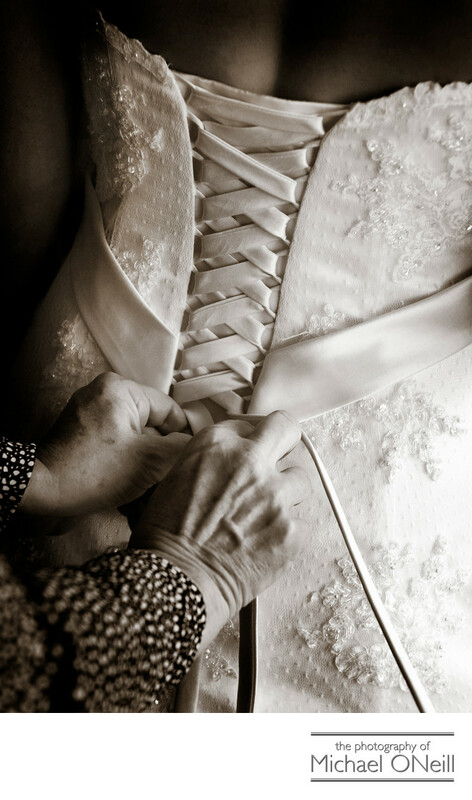 When the bride was finishing up getting dressed she asked her grandmother for help lacing up her beautiful wedding gown. This dress had this exquisite, ornate lacing up the back of it and I couldn’t help but feel the emotion as I watched her elderly hands deftly lace up the back of the beautiful wedding dress.A great wedding photographer doesn’t just observe and record the details and activities of the wedding day. An exceptional wedding photographer gets to know his clients and learn which of their relationships are so important to them. I am the person you will meet with when you first come into my East Northport, NY studio and gallery to consult with me about your special day for the first time. I will personally photograph your engagement session before the wedding day...getting to know you on a more personal level and making you relaxed and comfortable in front of the camera. I will be the wedding photographer on your big day and will be personally responsible for creating and capturing your pictures for a lifetime of fond memories. After the wedding I will personally retouch and enhance all of your favorite photographs and create a unique wedding album design that you will cherish for a lifetime. An heirloom that you will proudly and lovingly share with your children and your children’s children.If you want a wedding photographer with heart...one that is sensitive to all of the special feelings and emotions that define you and those you love...then you should call me at once to discuss your plans and desires for the big day. I personally handle only one special event per day and my calendar fills up very quickly. I hope that I am available to work with you and your loved ones on your upcoming wedding.